God help me, I made myself a pair of socks. And I'm considering another pair. What's happening to me?! blindingly white color of my my skin. So you only get this little peek. These socks make me happy for a reason unrelated to knitting. You see, I have the feet of an eighty-year-old woman. As my feet have gotten worse over the last few years, I've embarked on a seemingly endless quest for the Perfect Shoes. Such shoes would (1) not do any additional damage to my bone structure, (2) allow me to wear my special, made-just-for-me inserts, and (3) not be hideously ugly. Of those requirements, the third is by far the most difficult to meet. Anyway, after having had some success with Land's End shoes, I just invested in a pair of Land's End Hand-sewn Clogs (on sale! ), my first ever foray into the world of clog-like shoes. I cannot deny that they are comfortable and good for my feet, but I've never been a huge fan of the way clogs look so it's a bit of an adjustment. Wearing crazy-colored, hand knit socks that peek out the back of my shoes, however, is helping! Colleen, your empathy is much appreciated. It was a sad day indeed when my podiatrist said to a 26-year-old me, "I think your days of fashion footwear are over." Oh, the humanity! Thanks Shannon! Yesterday I was told that getting better shoes would help my back while I'm standing all day at work. Later yesterday I was looking through the Lands End catologue, and then you were nice enough to link it directly for me. Two pairs of clogs are on their way to me. (Everything else I wanted was out of stock or else there would have been some mocs in there too!) 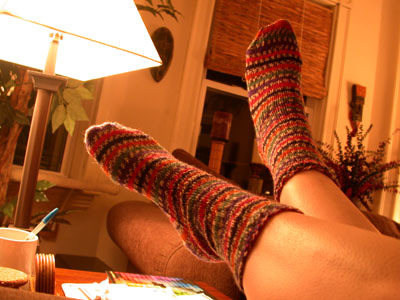 Enjoy showing off your new socks. Wow, love the socks! Thanks for the heads up on Land's End shoes. I love their stuff and already have two pair of their shoes (mocs and boots). I just ordered a pair of the clogs for myself. I have fallen arches and a morton's neuroma - these are the most comfortable shoes around that actually look cool! Wow the socks came out great! You should meet my husband. He's been told he's got the hips of an 80 yr old man. Bunion, check. Bursitis in the heel, check. He just invested in his first pair of clog-like shoes too. (He went with Merrells.) Does that mean I have to knit him socks now? Yours look great, by the way.